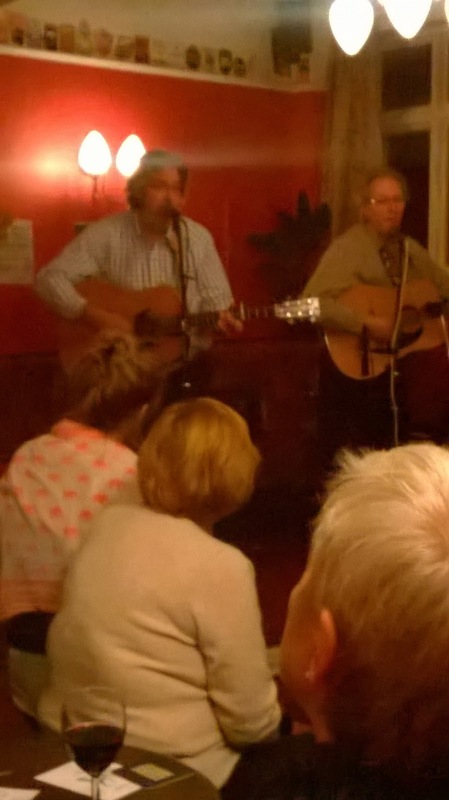 Down in the North of England on a weekend’s football groundhopping duty, I was delighted to note The Crocker Brothers were being “allowed out” as their own website puts it, to perform one of their infrequent gigs. Now although I have over recent years developed a late-flowering fondness for bluegrass/Americana music, I have to own up to only being aware of The Crocker Brothers existence due to a bit of internet poking about I did some years back in order to find out what happened to the original members of Cockney Rebel. For one of the aforementioned Brothers is in fact the chap who in a previous existence was Rebel violinist Jean-Paul Crocker. He was the tall, pouting, rather intimidating looking one. After the original band members parted company, JP with fingers suitably burned one imagines, reverted to being plain old John and, along with his brother David and bass guitar player Alex Somerville formed bluegrass-playing outfit The Crocker Brothers. Wherein he has resided these past four decades. This gig took place in The Volunteer Arms in York, a pleasing hostelry which regularly hosts live music if a notice on the wall announcing upcoming acts is to be believed. There were no more than around 50 folks in the place this particular evening, with perhaps half of us watching the performance, and the remainder way at the back nattering away happily. 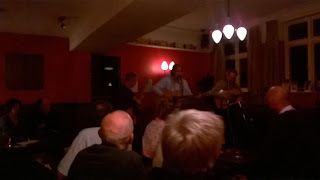 The band were really rather entertaining, reveling in the intimate setting, performing mainly covers of tunes by the likes of Larry Sparks, George Jones and The Stanley Brothers. I think there was only one original in the portion of the set I saw: Broken Boy. John handled pretty much all of the vocals, and most of the between songs chat with an endearing line in self-deprecating wit. But I would, perhaps surprisingly, hazard that the real instrumental talent lies elsewhere in the band. Bass player Alex appeared to glide over his instrument, effortlessly creating a backbone for the Brothers to build their songs upon, whilst some of David’s picking, particularly once he strapped on his banjo was just breathtaking. A woman standing next to me was equally entranced, as she suddenly turned to me and stated “I wish I could learn to play like that”. I deadpan replied “Practice” in my best Father Ted Carnegie Hall joke. “But just look how fast his fingers are moving. How does he do that?”. “Practice”, I repeated, thinking I was being rather droll. She just gave me an odd look and moved a bit closer to her boyfriend. I was though both a touch surprised and disappointed John did not pick up a fiddle at some point during the performance, as it is an instrument integral to bluegrass. But perhaps his feels his violin days are best left forgotten. I only really had time to hang around for the first half of the set, so reluctantly left during the break. Which was a bit of a pity, as I noted another Crocker, Katherine was due to join the boys later. I assume she was a Crocker Sister, Crocker Wife or perhaps a Crocker Daughter or even a Crocker Cousin. I suppose I shall never know.